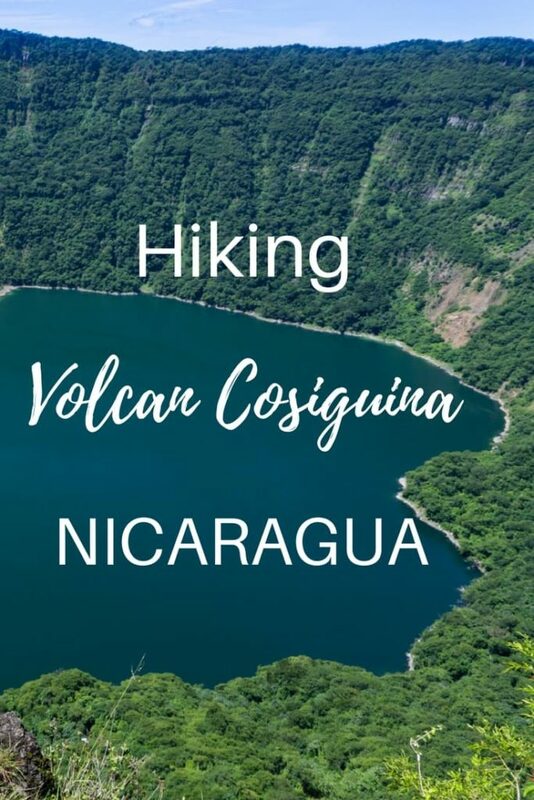 Imagine visiting an off the beaten path place in Central America, hiking up a volcano with a Pacific ocean view of 3 countries and arriving at the top to see a huge green crater lake. Sounds too good to be true? Welcome to Volcan Cosigüina in Potosi, Nicaragua. We arrived in Nicaragua from El Salvador crossing the Gulf of Fonseca by boat. And Potosi was our first stop during backpacking Nicaragua. 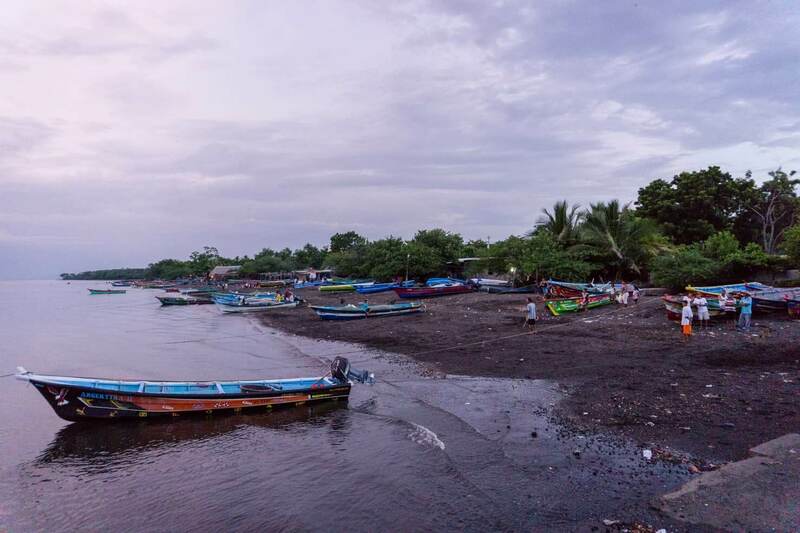 It is a small village on the very far north-west corner of Nicaragua, which tourists don’t usually visit but only pass through for the boat transfer to El Salvador. The only thing you can do here is hike a volcano. 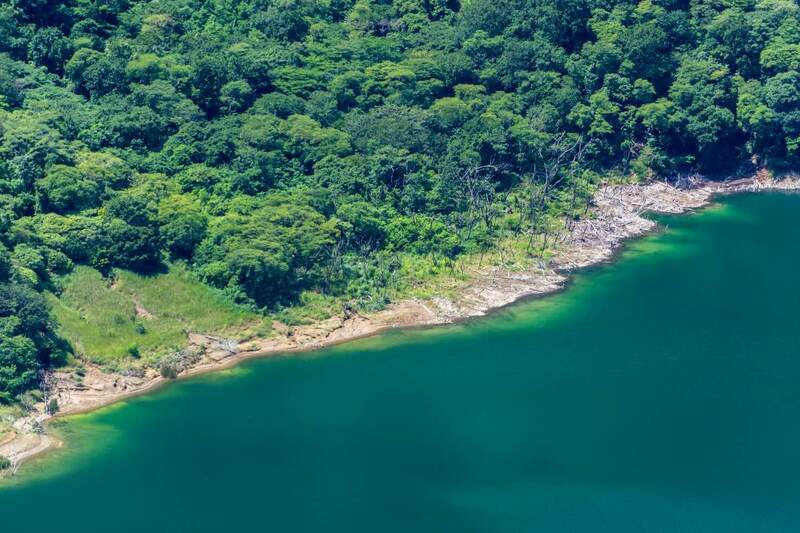 Not just any ordinary volcano – when it erupted in 1835, it was heard 300km away and caused the most violent volcanic eruption in Nicaragua’s history. 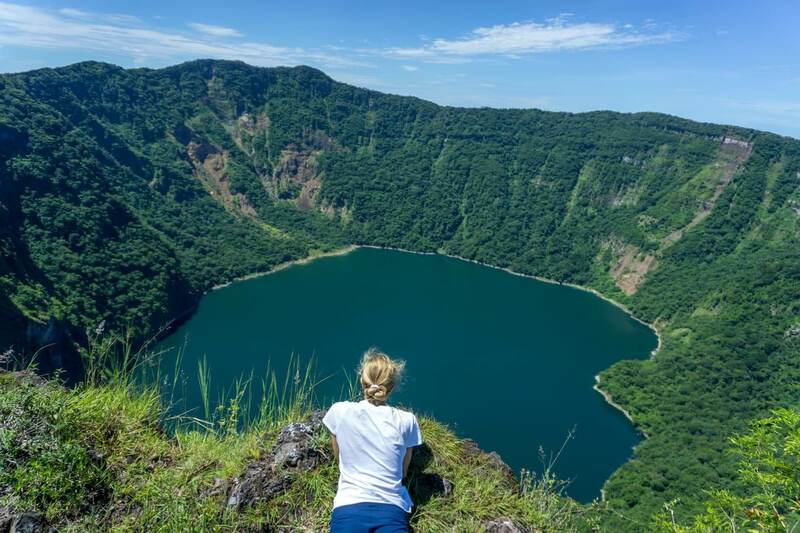 Large chunks of the crater were blown away forming small islands in the Gulf of Fonseca and Cosiguina volcano was left with a crater lake. Of course, we wanted to see this lesser-known natural wonder. We’ve visited almost all countries of Central America but Potosi in Nicaragua must be the hottest village there is. The ocean was so hot we didn’t feel like going for a swim and the high humidity makes you sweat in every step you make. It felt like hell even for Central America where hot weather and sweating all day is normal. Given the size of the village, there are two hotels which belong to the same family. When coming from the immigration office, they are easy to find since there is just one paved road forming the main street. We stayed in Hotel Brisas del Mar and took a full advantage of the cold shower and hammocks in the restaurant. The hike to the crater lake seemed like an easy one. And when the crew from our boat transfer from El Salvador confirmed, we decided to go without a guide. We woke up at 6 am, we packed some snacks, water and headed towards the bus stop. Two friendly locals joined us asking where we are going. They were surprised we don’t have a guide and offered to show us the trail. We turned left at the bus stop passing a baseball field. 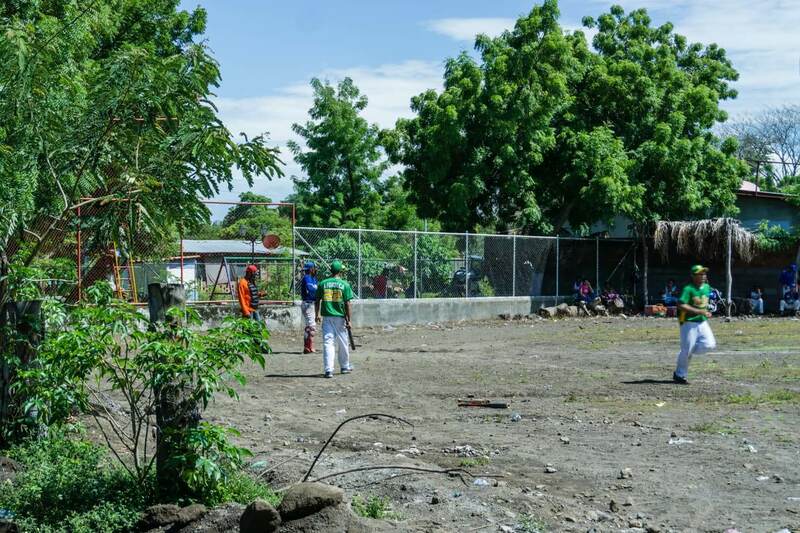 Surprisingly, countries of Central America are football fans but Nicaragua is all about the baseball. 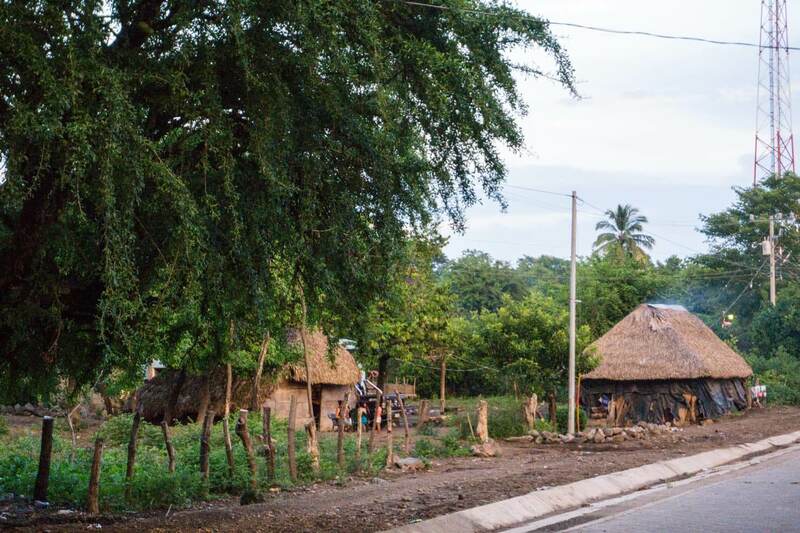 Walking on the dirt road with local Nicaraguans in their village was a very nice authentic experience. 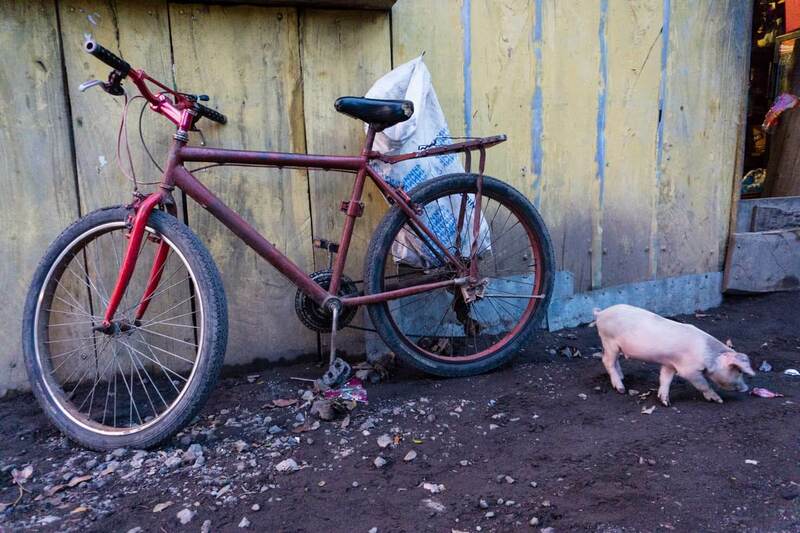 It’s not always easy to find that in Nicaragua because most of the places are full of tourists and backpackers. But not Potosi. After 2,5 kilometers from the hotel, we saw a huge sign of Reserva Natural Volcan Cosiguina. There was a logo of European Union and we later learned they are helping to protect the natural resources in the area. Always nice to see western countries starting programs in developing countries to improve the life of locals. We were given simple instructions: “Siempre ariba!” which means straight up. Luckily for us, the trail is well-trodden and continues through the shade of the jungle. Lizards were scurrying and many birds flying above us. Several locals were passing us on the horses carrying watermelons in giant bags. We were hoping to see one of the farmers on the field so we could buy a watermelon; the heat and humidity were unbearable. We’ve visited in October but locals told us the weather here is hot all year long. The next 2 kilometers through the jungle were flat and afterward, it started to go slightly uphill. There are also many signs, either to show directions or inform us of the surrounding fauna and flora. Halfway up the volcano, we already had a view over the Gulf of Fonseca. Despite the unbelievable heat, it was a very easy hike. The hardest part was the last half an hour to the rim of the crater lake. The landscape opened up; the sun was shining directly on us with no trees around to hide under. The hike took us 3,5 hours. Once we came to the top I actually said: Wow! We were 872m high on top of Cosiguina volcano with a huge 2km diameter crater lake below us. 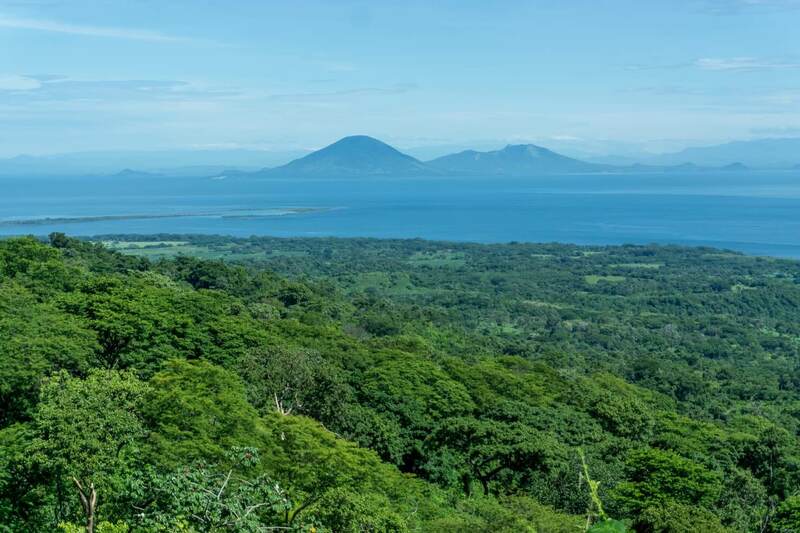 Before the massive eruption in 1835, it was one of the tallest volcanos in Central America. From here, we could see El Salvador, Honduras, and Nicaragua stretching over the Gulf of Fonseca. We watched the gas bubbles in the crater lake at the same time we gazed at the Pacific ocean. Stunning view! Our water supplies were quickly running out during the descent. We saw several lizards and spiders on the way. 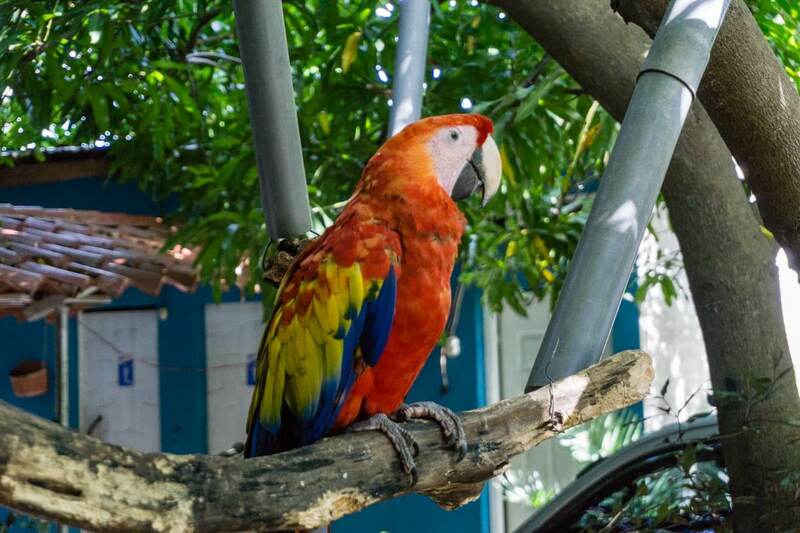 I guess the other wildlife including the macaws were hiding from the heat. When we reached the dirt road, a local man stopped his pick-up truck gesturing us to hop on. He saved us half an hour of walking back to town where we could buy some water. Our progressing dehydration was cut off with ice cold drinks from the pub. We joined the crowd and watched the baseball game of the local team as only tourists in town. Glad to made it back, I still remember the most refreshing shower of my life. We caught the last bus from Potosi at 3 pm and headed to Jiquilillo for surfing. 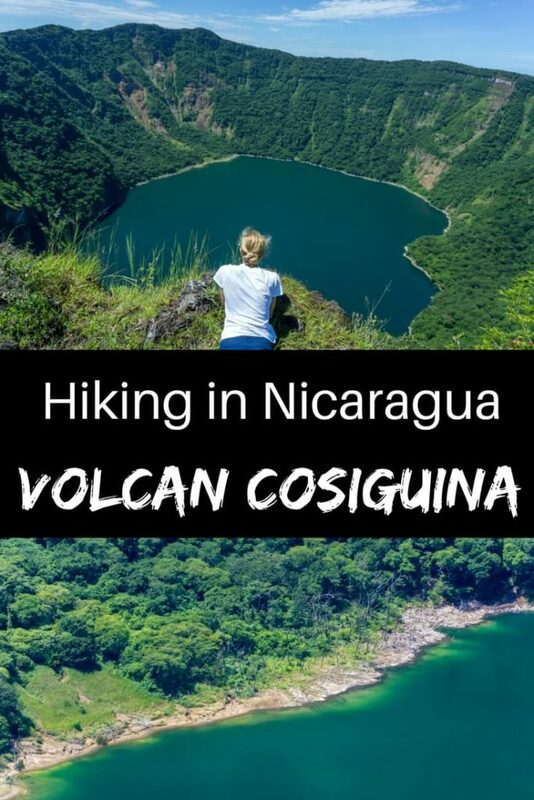 Are you thinking of visiting Potosi and hiking Cosiguina Volcano? You definitely should! 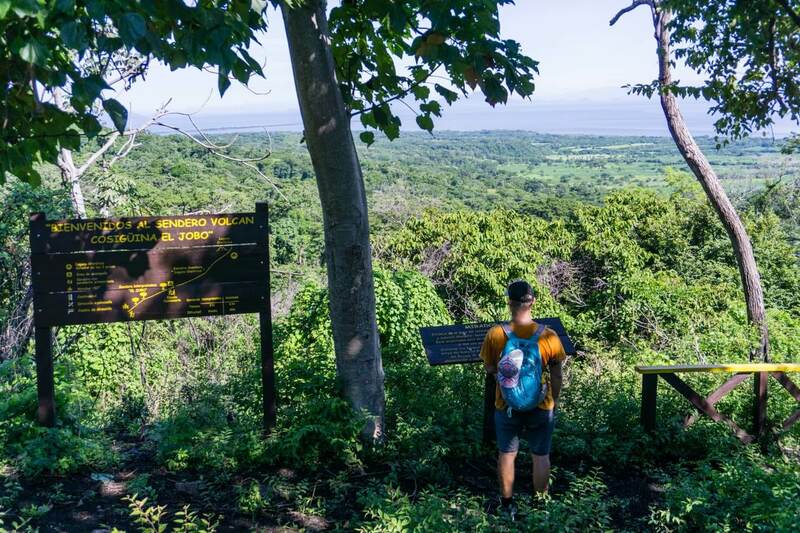 Experiences like this, surrounded by locals and not just a herd of backpackers, are becoming rarer in any part of Central America. The hotel can arrange a guide for 25USD (I think it’s more for larger groups). They can also arrange a ride to the trail, which will save you 5 km (roundtrip). You don’t need a guide for directions but consider the option, if you want to learn more about the wildlife or to support the local community. Because of the boat ride from El Salvador to Nicaragua, we had to cut our expenses and decided to go on our own. There is a natural spring near the main road frequented by locals but seeing the piles of garbage around it, we decided to skip it. Chicken bus from Potosi only goes to Chinandega (you can transfer to another one if you’re headed to Leon). As of July 2017, the bus from Chinandega to Potosi goes 7 times a day, last one departing at 5:30 pm. As with everything in Central America, check for current information before you go. Buses from Potosi to Chinandega go several times a day, the last one at 3:00 pm and cost 60NIO (2USD). You can catch it from the hotel which the bus passes. It honks many times when coming in the village, you can’t miss it. If you’re heading to El Salvador, check Ruta del Golfo for boat crossings. The boat crosses the Gulf of Fonseca few times a week and needs to be booked in advance (there is no internet in Potosi). Paid tours with travel agencies are available from Chinandega and Leon. I’m pretty sure you’ll be overpaying if you decide to choose this option. 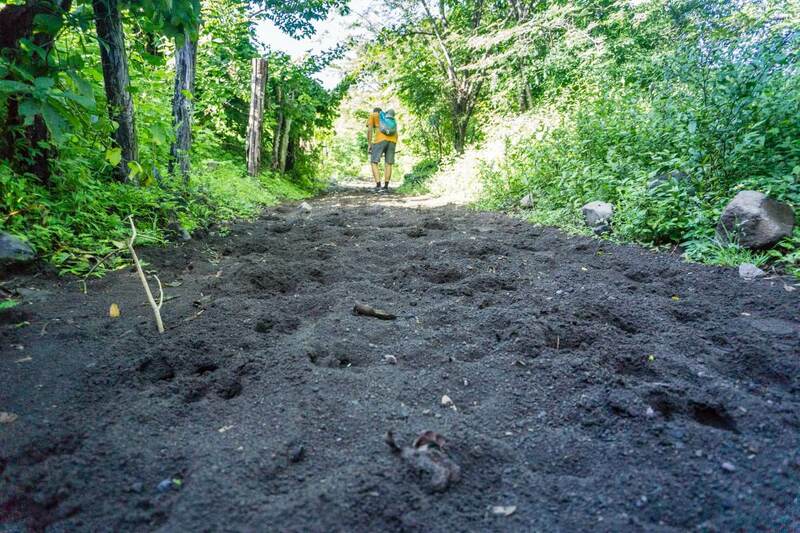 Have you ever hiked a volcano? Let us know which one!